This weekend, Hamilton football earned its first win of the season by upsetting Wesleyan at Corwin Stadium by the score of 33-29. The first half was touch-and-go for both teams with stretches where one team seemed to be unstoppable, while the other could not stop a fly. The second half was a little more solid for Wesleyan, but after a special teams blunder in the fourth quarter, the Cardinals were forced to play more aggressively, and thus made some inevitable, game-ending mistakes. The home team had a good statistical output on paper: a time of possession of 33:56, offensive production totaling 413 yards, and a third down efficiency rate of 15 for 22. However, Wesleyan was undisciplined and gave up over a hundred yards in penalties, which played a large part in their disappointing loss on Saturday. The first quarter started off slowly for the Cards, as the Continentals were able to force a three-and-out to start the game. On the following drive the Cardinal defense was unable to contain the opposing offense as Hamilton made a handful of chunk plays to score the first touchdown of the game with a 26-yard pass. 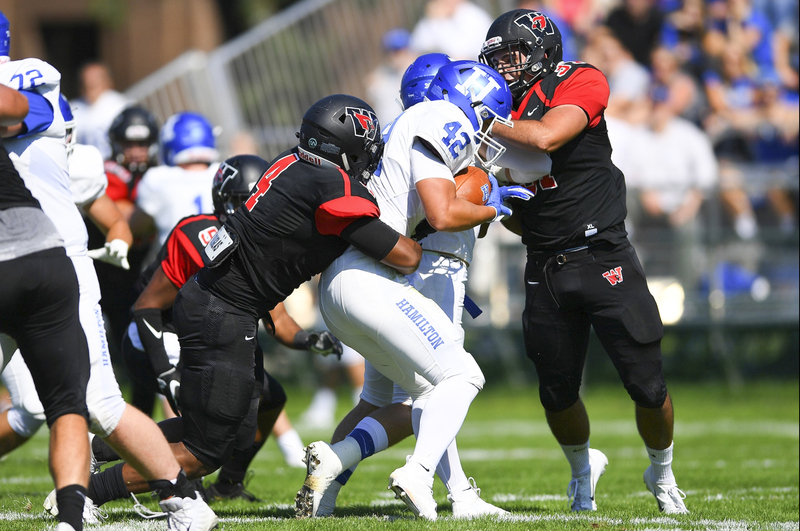 Wesleyan seemed to shake off some of the rustiness of the drive with a few well-executed plays highlighting offensive weapon David Estevez ’22, though the drive stalled, and the Red and Black were forced to punt. Hamilton was in a similar position and despite a pair of decent gains, they too were forced to punt the ball. This helped wake up the Wesleyan offense, and soon enough, Mark Piccirillo ’19 and company were diving up the field. Though a late holding call on Wesleyan seemed to doom this scoring attempt at the very beginning of the 2nd quarter, Piccirillo and wide receiver Joe Scancarella ’21 connected for a dazzling 37-yard touchdown to bring the score even at 7-7. On the following drive, the Cardinals stepped up on defense to force a three-and-out. 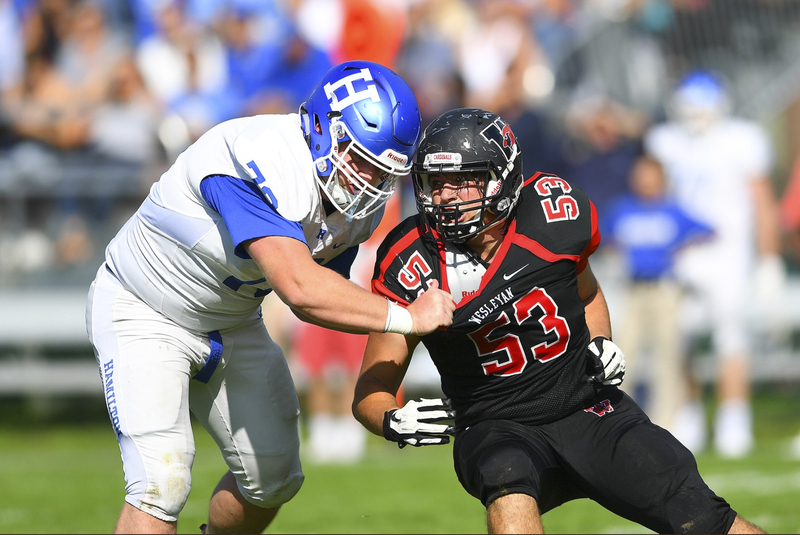 Linebacker and captain Brandon Morris ’19 played well, proving again why he is one of the best linebackers in the NESCAC. This past Saturday, he surpassed 175 career tackles, a milestone that should be getting more people’s attention. 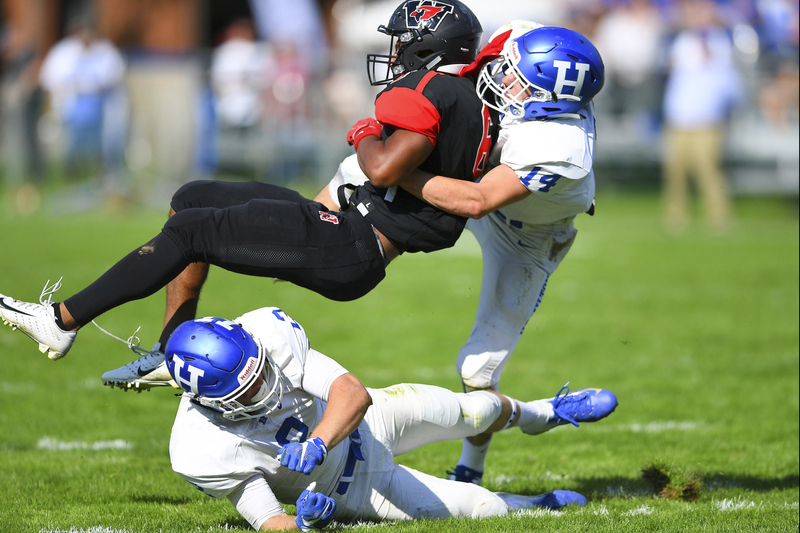 An ill-advised late hit on a punt return put Hamilton in dangerous position to score on Wesleyan’s 34-yard line, but strong defensive play, punctuated with a pivotal fourth down stop by Taj Gooden ’21, helped prevent Hamilton from taking advantage of this opportunity. There were many highs and lows like this throughout the game. However, deep into the second half, the lows became much more prominent. Hamilton kicked off the second half with a bang, making it all the way to the Wesleyan 30-yard line in just four plays. Though the defense made a strong effort to slow them down and almost succeeded, another penalty pushed them back to the six-yard line and soon enough Hamilton had the lead at 20-14. Wesleyan took the its first lead of the game shortly after a brutal eight minute, 80-yard drive with key plays by weapons Dario Highsmith ’20 and Glenn Smith ’21 before Piccirillo scored with a QB sneak to take the game to 21-20. The Continentals answered quickly, cruising down the field to the Cards’ red zone to finish the third quarter and soon scored to start the fourth quarter, taking back the lead. Even though the Piccirillo and Lundevall continued to connect, putting another TD on the board, Wesleyan did not have enough to come away with a victory. After Hamilton blocked a late punt and recovered it in the endzone, the Red and Black found themselves too desperate and turned the ball over, sealing the victory for Hamilton. Though the Cardinals definitely improved in certain areas this Saturday, such as third down conversions, they struggled greatly both with penalties and on special teams. There were many times where an ill-advised hit pinned the Cards. Similarly, the Red and Black found it difficult to contain Hamilton’s returners on both punts and kickoffs while making little progress themselves with similar opportunities. The squad looks to get back into the groove in the coming weeks against Colby and Bates in back-to-back away matches. In happier news, senior offensive lineman Joe Wilson has been nominated as a semifinalist for the prestigious William V. Campbell Trophy for exceptional student athletes around the nation. The Argus wishes him the best of luck in the competition.